A softbox is a term that describes an enclosure that surrounds a light source on all sides and diffuses the light that escapes from it. Now, when you open up or you pull back the diffuser, you’ll look inside and you’ll notice there’s a silver reflector on the inside. What this is going to do, is take harsh light, and it’s going to bounce all the way through here and then through the diffuser, it’s going to come out nice and soft. There are many different types of softboxes. The key elements you have to pay close attention to is what’s happening on the backend here. So the softbox itself has to connect to something. For this particular softbox, this is meant for speed lights. So we just simply put our speed light in here and we fire away. 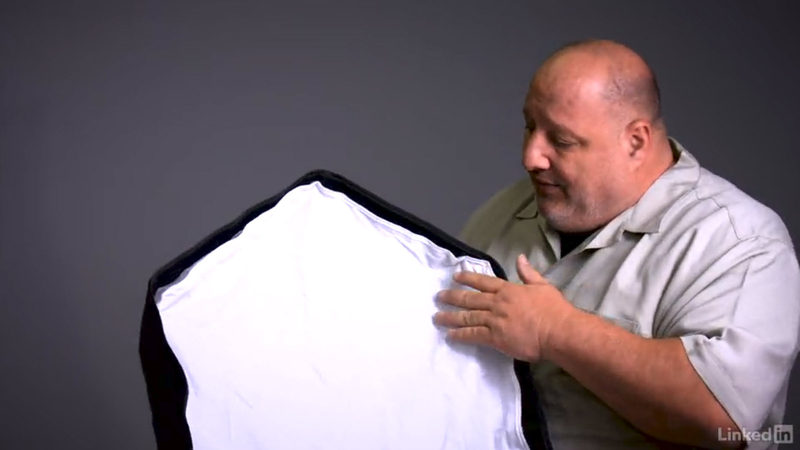 When purchasing a softbox, you also purchase what’s called a ring. Now the softbox connects to the ring and the ring itself is what connects to your light. That’s going to be specific just for your lights. The rings themselves you can order separately from the actual softbox.